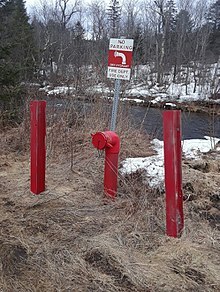 A fire hydrant, also called a fireplug, fire pump, jockey pump, or simply pump, is a connection point by which firefighters can tap into a water supply. It is a component of active fire protection. 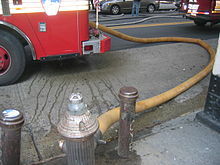 A New York City hydrant hooked to an FDNY fire engine with a turgid hose actively pumping water. 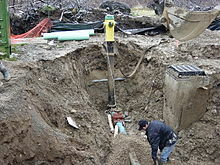 The user attaches a hose to the fire hydrant, then opens a valve on the hydrant to provide a powerful flow of water, on the order of 350 kPa (50 pounds per square inch gauge (psig)) (this pressure varies according to region and depends on various factors including the size and location of the attached water main). This user can attach this hose to a fire engine, which can use a powerful pump to boost the water pressure and possibly split it into multiple streams. One may connect the hose with a threaded connection, instantaneous "quick connector" or a Storz connector. A user should take care not to open or close a fire hydrant too quickly, as this can cause a water hammer, which can damage nearby pipes and equipment. The water inside a charged hose line causes it to be very heavy and high water pressure causes it to be stiff and unable to make a tight turn while pressurized. When a fire hydrant is unobstructed, this is not a problem, as there is enough room to adequately position the hose. Most fire hydrant valves are not designed to throttle the water flow; they are designed to be operated full-on or full-off. The valving arrangement of most dry-barrel hydrants is for the drain valve to be open at anything other than full operation. Usage at partial-opening can consequently result in considerable flow directly into the soil surrounding the hydrant, which, over time, can cause severe scouring. Gate or butterfly valves can be installed directly onto the hydrant orifices to control individual outputs and allow for changing equipment connections without turning off the flow to other orifices. These valves can be up to 12 inches in diameter to accommodate the large central "steamer" orifices on many US hydrants. It is good practice to install valves on all orifices before using a hydrant as the protective caps are unreliable and can cause major injury if they fail. When operating a hydrant, a firefighter typically wears appropriate personal protective equipment, such as gloves and a helmet with face shield worn. High-pressure water coursing through a potentially aging and corroding hydrant could cause a failure, injuring the firefighter operating the hydrant or bystanders. In most jurisdictions it is illegal to park a car within a certain distance of a fire hydrant. In North America the distances are commonly 3 to 5 m or 10 to 15 ft, often indicated by yellow or red paint on the curb. The rationale behind these laws is that hydrants need to be visible and accessible in an emergency. 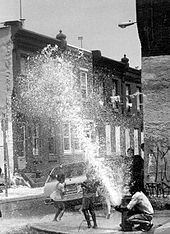 Children playing in the spray of a fire hydrant in Philadelphia, Pennsylvania. To prevent casual use or misuse, the hydrant requires special tools to be opened, usually a large wrench with a pentagonal socket. Vandals sometimes cause monetary loss by wasting water when they open hydrants. Such vandalism can also reduce municipal water pressure and impair firefighters' efforts to extinguish fires. Sometimes those simply seeking to play in the water remove the caps and open the valve, providing residents a place to play and cool off in summer. However, this is usually discouraged as residents have been struck by passing automobiles while playing in the street in the water spray. In spite of this, some US communities provide low flow sprinkler heads to enable residents to use the hydrants to cool off during hot weather, while gaining some control on water usage. Most fire hydrants in Australia are protected by a silver-coloured cover with a red top, secured to the ground with bolts to protect the hydrant from vandalism and unauthorized use. The cover must be removed before use. In most areas of the United States, contractors who need temporary water may purchase permits to use hydrants. The permit will generally require a hydrant meter, a gate valve and sometimes a clapper valve (if not designed into the hydrant already) to prevent back-flow into the hydrant. Additionally, residents who wish to use the hydrant to fill their in-ground swimming pool are commonly permitted to do so, provided they pay for the water and agree to allow firefighters to draft from their pool in the case of an emergency. Municipal services, such as street sweepers and tank trucks, may also be allowed to use hydrants to fill their water tanks. Often sewer maintenance trucks need water to flush out sewerage lines, and fill their tanks on site from a hydrant. If necessary, the municipal workers will record the amount of water they used, or use a meter. Since fire hydrants are one of the most accessible parts of a water distribution system, they are often used for attaching pressure gauges or loggers or monitor system water pressure. Automatic flushing devices are often attached to hydrants to maintain chlorination levels in areas of low usage. Hydrants are also used as an easy above-ground access point by leak detection devices to locate leaks from the sound they make. Fire hydrants may be used to supply water to riot control vehicles. These vehicles use a high pressure water cannon to discourage rioting. In areas subject to freezing temperatures, at most, only a portion of the hydrant is above ground. The valve is located below the frost line and connected by a riser to the above-ground portion. A valve rod extends from the valve up through a seal at the top of the hydrant, where it can be operated with the proper wrench. This design is known as a "dry barrel" hydrant, in that the barrel, or vertical body of the hydrant, is normally dry. A drain valve underground opens when the water valve is completely closed; this allows all water to drain from the hydrant body to prevent the hydrant from freezing. In warm areas, hydrants are used with one or more valves in the above-ground portion. Unlike with cold-weather hydrants, it is possible to turn the water supply on and off to each port. This style is known as a "wet barrel" hydrant. Both wet- and dry-barrel hydrants typically have multiple outlets. Wet barrel hydrant outlets are typically individually controlled, while a single stem operates all the outlets of a dry barrel hydrant simultaneously. Thus, wet barrel hydrants allow single outlets to be opened, requiring somewhat more effort, but simultaneously allowing more flexibility. A typical U.S. dry-barrel hydrant has two smaller outlets and one larger outlet. The larger outlet is often a Storz connection if the local fire department has standardized on hose using Storz fittings for large diameter supply line. The larger outlet is known as a "steamer" connection, because they were once used to supply steam powered water pumps, and a hydrant with such an outlet may be called a "steamer hydrant", although this usage is becoming archaic. 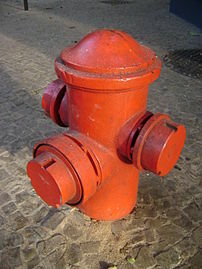 Likewise, an older hydrant without a steamer connection may be called a "village hydrant." Various components of the pumping hydrant are: Bonnet: The conical cap for the hydrant, or bonnet, holds the operating stem nut in place and protects the hydrant from mechanical damage and water penetration. Branch: The branch pipe serving the hydrant from the city main is one restriction for the overall capacity of a hydrant. While older systems often connect hydrants with 4-inch branch pipe, a minimum of 6-inch pipe should be used to limit pressure loss and permit greater flow capacity. Our friction loss tool can be helpful in estimating loss through these pipes. Flange: The flange at the base of the hydrant is the point of connection for the hydrant to the rest of the barrel. While the dimension from the bonnet to the flange of the hydrant is standard, the height of the flange becomes important during installation as it determines the height of the outlets. Because hydrants need to be quickly accessed during an active fire, hydrant outlets need to be installed tall enough to allow a full-revolution of a hydrant wrench from the lowest outlet. 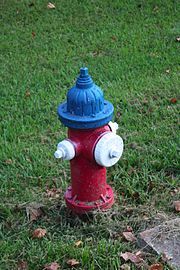 Hydrant Color: Some jurisdictions paint hydrants or hydrant bonnets to identify the capacity of the hydrant. Pump: A traditional dry barrel fire hydrant contains three outlets: two 2 1/2-inch (65 mm) side outlets and a single 4 1/2-inch (115 mm) or 6-inch (150 mm) "pumper" outlet. The latter outlet gets its name as it is often the preferred choice for the fire department to connect and feed pumper trucks. Stem Nut: The stem nut is the key to operating the valve within the hydrant. Typically shaped as a pentagon, the stem nut will turn the operating stem of the hydrant and raise the valve to an 'open' position when turned with a hydrant wrench. Thrust Block: Unless mechanically restrained, thrust blocks serve as a way to distribute the hydraulic force of the pipe network into the soil. Valve: When in the 'open' position, the valve at the bottom of a dry barrel hydrant rises to plug drain holes and simultaneously permit water to fill the barrel of the hydrant. When in the 'closed' position, the valve lowers to block water passage and re-open drain holes at the bottom of the hydrant. These drain holes act as weeps which slowly drain the hydrant barrel and help prevent freezing. Water Supply & Storage: A water supply for a fire hydrant system can be derived from a reliable source of water such as; street mains, static water supply such as a tank or dam. Water storage must also include a facility for automatic replenishment (make-up water) due to losses from evaporation, leakage, periodic testing, etc. The capacity or volume of the water supply or storage must also be taken into account as part of the hydraulic analysis. Layflat Fire Hose: Some buildings may also require as part of the approved design the installation of ancillary equipment such as a layflat fire hose. A layflat fire hose is manufactured in accordance with Australian Standard AS2792 is a flexible hose and nozzle that may be connected to a hydrant. Hydrant Marker Plates: Found on power poles, fences, or street-signs, these are a comprehensive and effective system of identification. The plate consists of several codes; H (Potable water Hydrant), RH (Recycled/Non Potable), P (Pathway, where the hydrant cover can be found), R (Roadway). The plate is vertically oriented, around 8 cm wide, and 15 cm high. Hydrant coloring may be due to either purely practical criteria or more artistic. 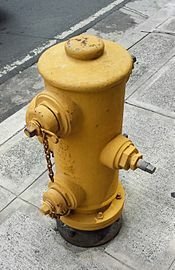 In the United States, the AWWA and NFPA recommend hydrants be colored chrome yellow for rapid identification apart from the bonnet and nozzle caps which should be coded according to their available flow. Class AA hydrants (>1500 gpm) should have their nozzle caps and bonnet colored light blue, Class A hydrants (1000–1499 gpm), green, Class B hydrants (500–999 gpm), orange, Class C hydrants (0–499 gpm), red and inoperable or end-of-system (risking water hammer) black. This aids arriving firefighters in determining how much water is available and whether to call for additional resources, or find another hydrant. Other codings can be and frequently are used, some of greater complexity, incorporating pressure information, others more simplistic. In Ottawa, Ontario, hydrant colors communicate different messages to firefighters; for example, if the inside of the hydrant is corroded so much that the interior diameter is too narrow for good pressure, it will be painted in a specific scheme to indicate to firefighters to move on to the next one. In many localities, a white or purple top indicates that the hydrant provides non-potable water. Where artistic and/or aesthetic considerations are paramount, hydrants can be extremely varied, or more subdued. In both instances this is usually at the cost of reduced practicality. In Germany and The Netherlands, most hydrants are located below ground (resp. Unterflurhydrant and ondergrondse brandkraan) and are reached by a riser (resp. Standrohr and standpijp), which provides the connections for the hoses. Hydrant in Demorest, Georgia painted with an American patriotic theme. German underground hydrant with Storz hose connections. Hydrant sign in Cork, Ireland, dated 1858. 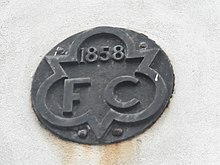 The letters "FC" indicate the old name for a hydrant, firecock. British fire hydrant and sign — the sign indicates the hydrant is 100 mm in diameter, 1 metre from the sign. Underground hydrant in Russia marked with a plate and a red cone. In the United Kingdom and Ireland, hydrants are located in the ground. Yellow "H" hydrant signs indicate the location of the hydrants, and are similar to the blue signs in Finland. 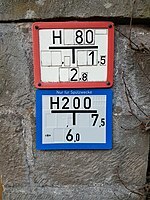 Mounted on a small post or nearby wall etc., the two numbers indicate the diameter of the water main (top number) and the distance from the sign (lower number). Modern signs show these measurements in millimetres and metres, whereas older signs use inches and feet. Because the orders of magnitude are so different (6 inches versus 150 mm) there is no ambiguity whichever measuring system is used. In areas of the United States without winter snow cover, blue reflectors embedded in the street are used to allow rapid identification of hydrants at night. In areas with snow cover, tall signs or flags are used so that hydrants can be found even if covered with snow. In rural areas tall narrow posts painted with visible colours such as red are attached to the hydrants to allow them to be found during heavy snowfall periods. The tops of the fire hydrants indicate the amount of pressure each one will put out. This is good because it makes the choice of what hydrants will be used to supply water to the fire scene. The hydrant bodies are also color-coded. These markings and colours are required by the NFPA(National Fire Protection Agency). In Australia, hydrant signage varies, with several types displayed across the country. 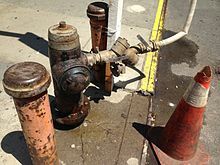 Most Australian hydrants are underground, being of a ballcock system (spring hydrant type), and a separate standpipe with a central plunger is used to open the valve. Consequently, hydrant signage is essential, because of their concealed nature. Painted markers – Usually a white or yellow (sometimes reflective paint) triangle or arrow painted on the road, pointing towards the side of the road the hydrant will be found on. These are most common in old areas, or on new roads where more advanced signs have not been installed. These are almost always coupled with a secondary form of signage. The codes listed above, Potable/Non-potable at the top, Path/Roadway on the bottom of the plate. Below this, a number giving the distance to the hydrant (in meters), then a second number below that giving the size (in millimeters) of the water main. A black line across the center of the plate indicates the hydrant is found on the opposite side of the road to which the plate is affixed. Plates for recycled water have a purple background, as well as the RH code, normal potable hydrants are white, with the H code. A blue reflector marks the location of the fire hydrant. these are placed on one side or the other of the centre line of the road, to indicate on which side of the road the hydrant lies. They are visible for several hundred meters at night in heavy rain, further in clear conditions. In Germany the hydrant marker plates follow the style of other marker plates pointing to underground installations. Fire hydrant marker plates have a red border. Other water hydrants may have a blue border. A gas hydrant would have a yellow background instead of a white one for fire hydrants. All of them have large central T with the installation identification on top of it - an "H" or older "UH" is located in the ground, a "OH" is above ground, followed by the pipe inner diameter in millimeters (with a small 80 mm in residential areas). The numbers around the T allow to locate the installation in reference to the plate's location - the number left of the T is in meter left of the sign, the number right of the T is in meter right of the sign, and number below the T tells the distance in meter in front of the sign, where a negative number would point to a place behind the sign. The distance numbers are always given with a comma decimeter precision. If it is not a common fire hydrant type then another identification may be used, for example "300 m³" would point to a cistern usable to pump water from. In East Asia (China, Japan and South Korea) and former Socialist countries of Eastern Europe, there are two types of fire hydrants, of which one is on the public ground and the other inside a building. The ones inside a building are installed on a wall. They are big, rectangular boxes that also provide alarms (sirens), a fire extinguisher and, at certain times, emergency kits. In most areas fire hydrants require annual inspections and maintenance — they normally only have a one-year warranty, but some have 5- or even 10-year warranties, although the longer warranty does not remove the need for periodic inspections or maintenance. These inspections are generally performed by the local municipalities but they often do not inspect hydrants that are identified as private. Private hydrants are usually located on larger properties to adequately protect large buildings in case of a fire and in order to comply with the fire code. Such hydrants have met the requirements of insurance underwriters and are often referred to as UL/FM hydrants. Some companies are contracted out to inspect private fire hydrants unless the municipality has undertaken that task. Some fire hydrant manufacturers recommend lubricating the head mechanism and restoring the head gaskets and O-rings annually in order that the fire hydrant perform the service expected of them, while others have incorporated proprietary features to provide long-term lubrication of the hydrant's operating mechanism. In any case, periodic inspection of lubricants is recommended. Lubrication is generally done with a food-grade non-petroleum lubricant to avoid contamination of the distribution system. Occasionally a stone or foreign object will mar the seat gasket. In this case, most hydrants have a special seat wrench that allows removal of the seat to replace the gasket or other broken parts without removing the hydrant from the ground. Hydrant extensions are also available for raising a hydrant if the grade around the hydrant changes. Without extending the height, the wrenches to remove caps would not clear and the break flanges for traffic models would not be located correctly in case they were hit. 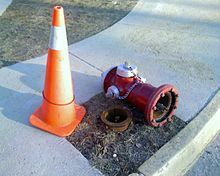 Hydrant repair kits are also available to repair sacrificial parts designed to break when hit by a vehicle. Many departments use the hydrants for flushing out water line sediments. When doing so, they often use a hydrant diffuser, a device that diffuses the water so that it does not damage property and is less dangerous to bystanders than a solid stream. Some diffusers also dechlorinate the water to avoid ground contamination. Hydrants are also sometimes used as entry or exit points for pipe cleaning pigs. In 2011, Code for America developed an "Adopt a Hydrant" website, which enables volunteers to sign up to shovel out fire hydrants after snowstorms. As of 2014, the system has been implemented in Boston, Providence, Rhode Island, Anchorage, Alaska, and Chicago. A dry hydrant by Passumpsic River in rural Vermont. In rural areas where municipal water systems are not available, dry hydrants are used to supply water for fighting fires. 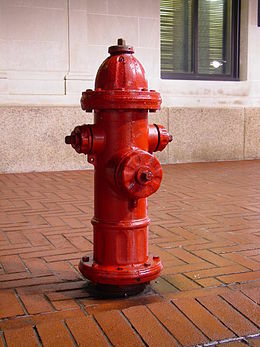 A dry hydrant is analogous to a standpipe. A dry hydrant is usually an unpressurized, permanently installed pipe that has one end below the water level of a lake or pond. This end usually has a strainer to prevent debris, such as frogs, from entering the pipe. The other end is above ground and has a hard sleeve connector. When needed, a pumper fire engine will pump from the lake or pond by drafting water. This is done by vacuuming the air out of the dry hydrant, hard sleeve, and the fire engine pump with a primer. Because lower pressure now exists at the pump intake, atmospheric pressure on the water and the weight of the water forces water into part of the dry hydrant above water, into the hard sleeve, and finally into the pump. This water can then be pumped by the engine's centrifugal pump. Water wells are also sometimes classified as fire hydrants if they can supply enough water volume and pressure. Standpipes are connections for firehoses within a building and serve the same purpose as fire hydrants in larger structures. Standpipes may be "dry" or "wet" (permanently filled with water). ^ "National Fire Protection Association Report (p. 18)" (PDF). National Fire Protection Association (NFPA). August 15, 2013. All barrels are to be chrome yellow except in cases where another color has already been adopted. ^ BS 750: "Specification for underground fire hydrants and surface box frames and covers" (2012). ^ "Good Stewardship for Schools Premises p. 18" (PDF). Cambridgeshire County Council. 2009. Archived from the original (PDF) on March 4, 2012. ^ a b Lamm, Willis. "Hydrant color codes and markings". Fire hydrant.org. Water supply office. Retrieved 31 March 2015. ^ "Hydrant Flushing FAQ, United States of America" (PDF). ^ Raja, Tasneem (2014). "Is Coding the New Literacy?". Mother Jones. Retrieved 2014-06-21. Hinds, Conrade C. (9 October 2012). The Great Columbus Experiment of 1908: Waterworks that Changed the World. Arcadia Publishing. ISBN 978-1-61423-685-6. U.S. Patent 909 — Issued to John Jorden on September 8, 1838 for "...a new and useful improvement in Fire-Plugs and Hydrants...". This is an early wooden bodied hydrant, the earliest hydrant patent extant; the patent office itself burned to the ground in 1836, taking with it all prior hydrant patents. U.S. Patent 37,466 — Issued to Richard Stileman on January 20, 1863. An early iron hydrant, believed the first patented hydrant with the larger size steamer port to supply steam fire engines. Manufactured and marketed as the Stileman hydrant. See also Stileman page at FireHydrant.org. U.S. Patent 80,143 — Issued to Zebulon Erastus Coffin on July 21, 1868. This is a cast iron hydrant very similar to modern fire hydrants, it was produced by Boston Machine Co. See also Boston Machine page at FireHydrant.org. U.S. Patent 94,749 — Issued to Birdsill Holly on September 14, 1869. See also Holly page at FireHydrant.org.